We invite you to explore our website to learn more about our private, 55+, planned community of manufactured homes, consisting of individually resident-owned and occupied homes & lots, known as Florentine Estates, where homeowners equally own all facilities, amenities and common grounds for their enjoyment. 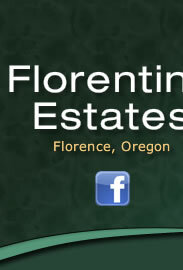 The City of Florence is nestled between the Pacific Ocean and the coastal-forested foothills of Oregon. Its mild climate, scenic areas with rivers, lakes, sand dunes and abundant activities for retirees, has earned Florence the notoriety as “one of America’s Top 10 Best Places to Retire”.